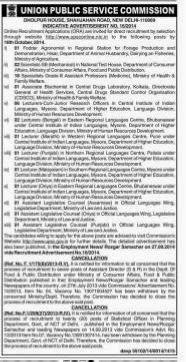 Union Public Service Commission (UPSC) published an official notification through Advertisement No. 16/2014 for various posts. You can view / download full advertisement for more details including age limit, educational qualification, no. of posts etc… You can apply online at http://upsconline.nic.in till last date for online application, which is shown below. View / download official advertisement for more details.